Block malware, prevent intrusions and control applications, for your entire network traffic, with our industry-leading firewall solutions. Big Iron provides Dell SonicWALL solutions, one of the leading providers of next-generation firewalls (NGFWs). The proven SonicOS firmware is at the core of every Dell SonicWALL NGFW. SonicOS leverages scalable, multi-core hardware architecture and single-pass, low latency. The Reassembly-Free Deep Packet Inspection® (RFDPI) engine scans all traffic regardless of port or protocol. SonicWALL NGFWs ensure that every byte of every packet is inspected while maintaining the high performance and low latency that busy networks require. 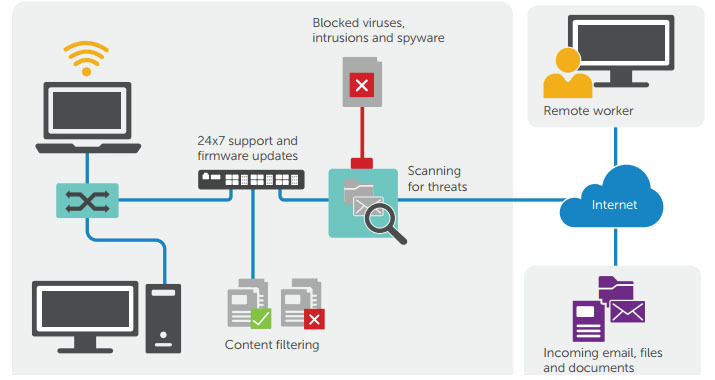 Unlike other firewalls, the SonicWALL single-pass RFDPI engine enables simultaneous, multi-threat and application scanning, as well as analysis of any size file, without packet reassembly. This enables Dell SonicWALL NGFWs to massively scale to extend state-of-the-art security to growing and distributed enterprise networks. Stop security risks with the best Unified Threat Management (UTM) firewall for small businesses, retail deployments, distributed enterprises, remote sites and branch offices. Combine high-performance 802.11ac wireless technology with award-winning, advanced firewall protection. Receive unparalleled wireless security, and drastically simplify network setup and management. Applying the same security engine and services as our SuperMassive series, Dell Network Security Appliance (NSA) next-gen firewalls boost performance and reduce costs and complexity for distributed enterprises. The Dell SuperMassive 9000 series ensures the security, performance and scalability demanded by today’s larger enterprises with 10+ Gb infrastructures. SuperMassive E10000 firewalls set the standard for high-performance application control and threat prevention. Accelerate the effectiveness of your existing infrastructure, and improve the end-user experience. Reduce application latency, and conserve bandwidth for small to medium-sized organisations with remote and branch offices. Complete network security in a single integrated package. Dell™ SonicWALL™ Comprehensive Security Suite (CGSS) removes the complexity associated with choosing a host of add-on security services by integrating all the network security service required for total protection into a convenient, affordable package. We deliver enterprise-class wireless performance and security while dramatically simplifying network set up and management.